Figure 3-14. DOD Form 1387-1 (Military Shipment Tag). Home > Munitions Reference and Training Manuals > > Figure 3-14. DOD Form 1387-1 (Military Shipment Tag). Figure 3-13. 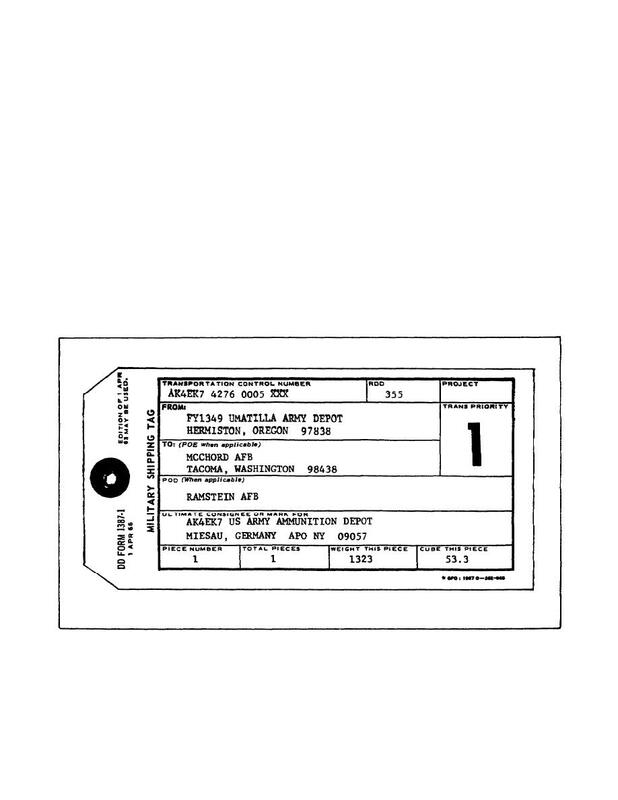 DD Form 1387 (Military Shipment Label). Figure 3-15. Proper Placement of the Shipping Label. the DOT markings or hazardous label you have just inspected. to make sure that it is correctly applied with waterproof adhesive. report. If it is not correct, check UNSAT and state your reason in the Remarks column. B (Standard Form 401), and Explosive C (Standard Form 402). See figure 3-17.
explosive labels are NOT correct, check UNSAT and explain the defect in the Remarks column.